The countdown continues. This is the ‘PR and the Social Web’ selection of the top ten wonders of the internet, brought to us during the first decade of the new millennium. Number 10 was a blogging platform and at number 9 it’s all about digging and burying. Number 9 – Digg: Founded in 2004 by web whizz Kevin Rose, Digg is one of a handful of sites like Delicious and Stumbleupon that hands the business of filtering, ordering and ultimately ranking of the internet to its users. What could be more web 2.0 than that? 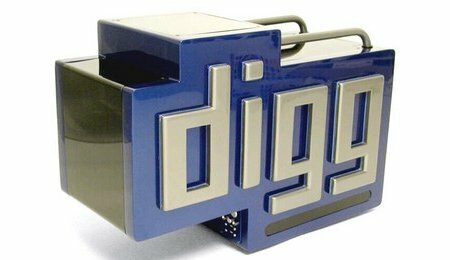 Digg.com allows users to discover and share content from anywhere on the web. People submit links, news stories and other content. The digg community votes on these links and stories. The ability to vote is central to what Digg is about: if you like something you digg it (geddit?) and if you don’t you ‘bury’ it by voting it down. Only the most Dugg stories appear on the front page but when they do it ensures a huge spike in traffic for the original host site. The site is also the focus of the hugely popular weekly podcast Diggnation hosted by founder Kevin Rose. The podcast covers many of the most discussed popular stories on Digg that week. It make be just outside the top 100 in the most visited sites on the web but it makes this top ten web wonders of the decade.